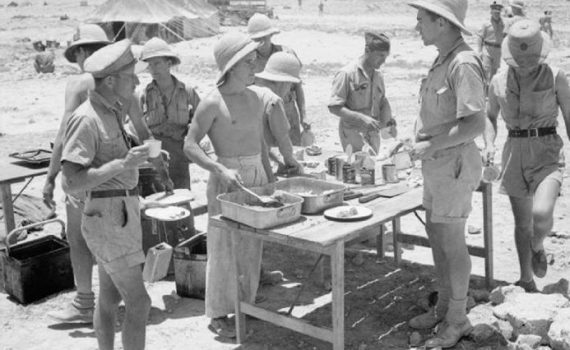 World War 2, North African theatre and this image shows the high degree of cross over between South African units and British ones – here standing around the field kitchen are both Royal Air Force and South African Air Force personnel – the South Africans are distinctive in their South African Union Defence Force pith helmets. These men formed part of No. 204 Group RAF and are taking lunch at Sidi Barrani, Egypt, while their respective units were acting in support of Operation Battleaxe. Operation Battleaxe was a British Army operation during the Second World War in June 1941, to clear eastern Cyrenaica of German and Italian forces and raise the Siege of Tobruk. It was the first time during the war that a significant German force fought on the defensive but the operation failed as British forces attacked strong defensive positions created by German General Erwin Rommel.